The Twistlock Box is a foldable reusable packaging with a new “active locking system”. This enables the box to be swiftly folded and set up again. 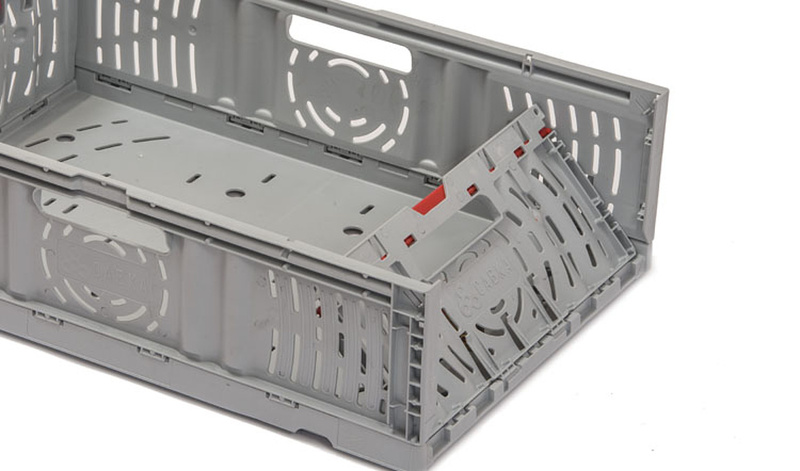 It can be stacked with all boxes currently on the market which fulfil the ISO standard. 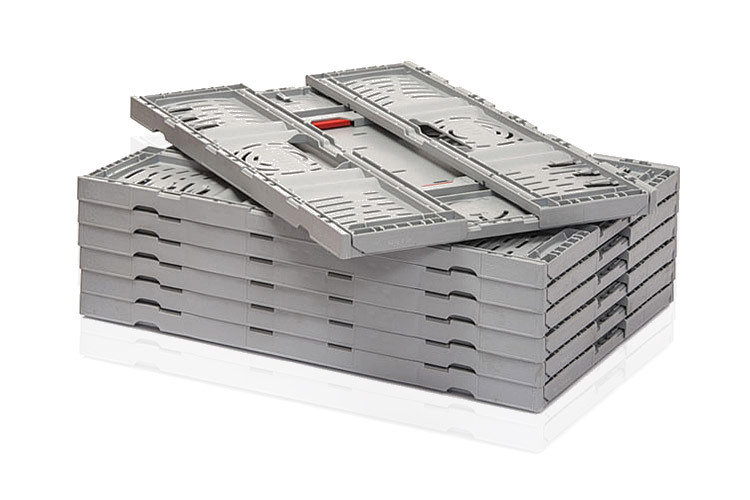 Boxes with base dimensions 600 mm x 400 mm and 400 mm x 300 mm can also be stacked together. The Twistlock Box has a very robust design. When stacked, it can support a static weight of 500 kg and a dynamic weight of 300 kg. It thus reduces the risk of breakage during transport and commissioning and also increases the handling speed. Broken components can be replaced and the box thus repaired. This increases the product’s lifespan! Although the Twistlock Box is very sturdy, it only has very little ribbing. This prevents a lot of dirt from settling. Less water is required for cleaning and the box can be dried more easily. Especially loose and sensitive goods such as i.e. 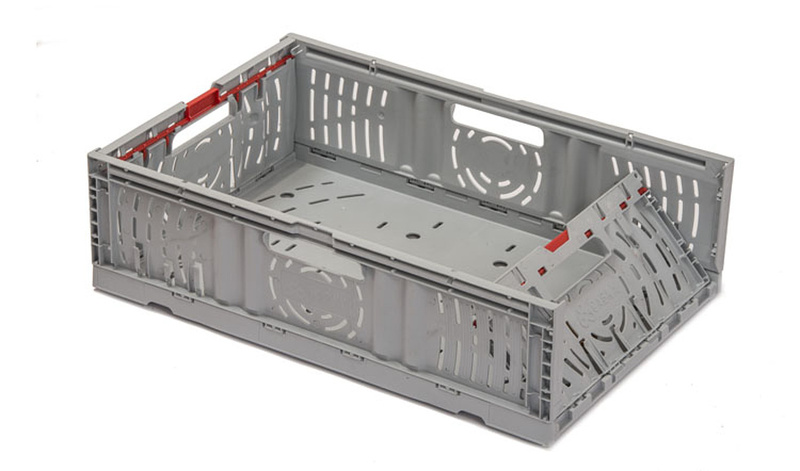 fruit and vegetables find optimal protection in the Twistlock Box thanks to its smooth interior surfaces. The model equipped with a ventilation opening ensures optimal ventilation during the cooling process. During the development of the Twistlock Box, high store was also placed on a modern and attractive design. This supports the presentation at the Point of Sale! 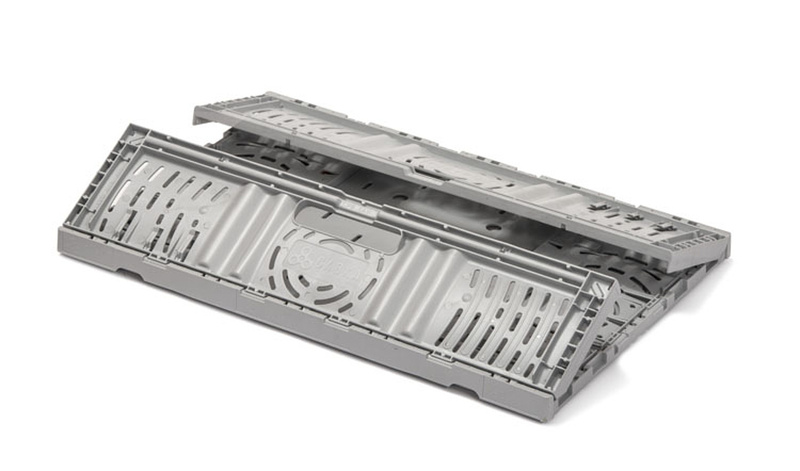 The Twistlock Box is the ideal packaging when it comes to reducing process costs. 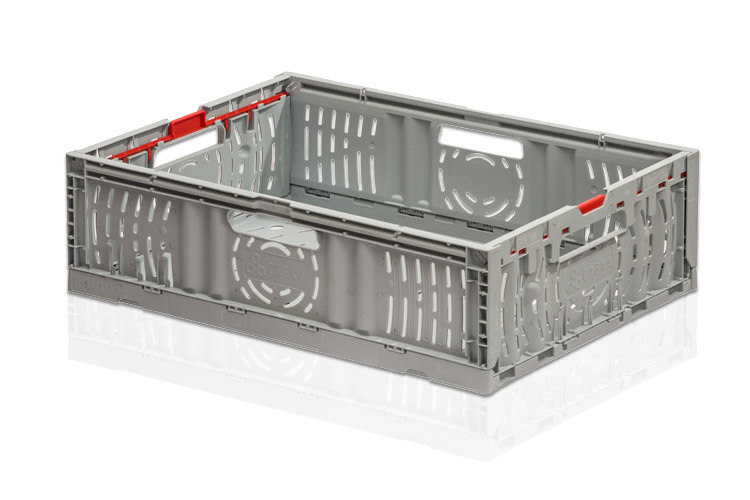 The optimized ratio of useable inner volume to size of the box guarantees a high capacity utilization of pallets, roller container, dollies etc. 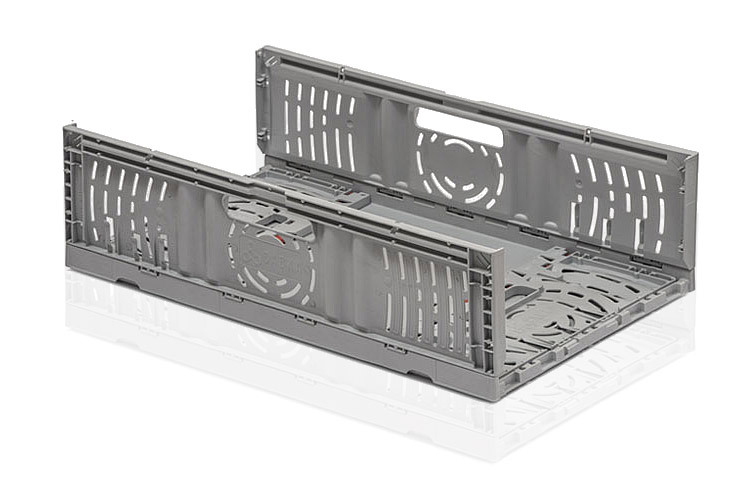 The Twistlock Box can be folded down to a height of just 28 mm when empty. 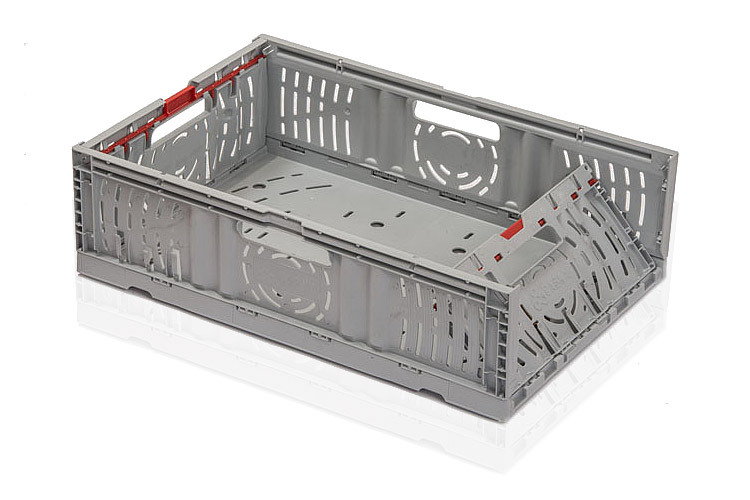 This enables large savings to be made with the storage and transport of empties. A fully loaded lorry can carry more than 10,000 folded boxes. This saves money and reduces CO₂-emissions during transport! 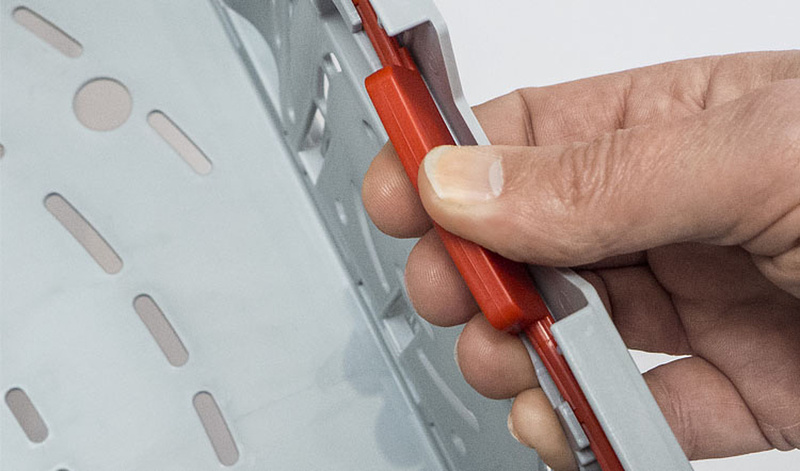 The Twistlock Box is made from polypropylene. This material is nice to touch and causes less noise on automated systems than other comparable synthetic materials. At the end of its life cycle, the Twistlock Box is pulverized and used for the production of new Twistlock Boxes. This contributes to sustainability and gives the Twistlock Box the gift of a second life! The Twistlock Box is available in several different sizes. The product range comprises of different heights with the base dimensions 600 mm x 400 mm and 400 mm x 300 mm. Set up short sides vertically until they lock into place. Make sure that all closures lock into place at the four corners. Boxes/europallet 624 pcs. 312 pcs. 312 pcs. 264 pcs. Boxes/truck* 20.592 pcs. 10.296 pcs. 10.296 pcs. 8.712 pcs. Europallets/truck* 33 pcs. 33 pcs. 33 pcs. 33 pcs. 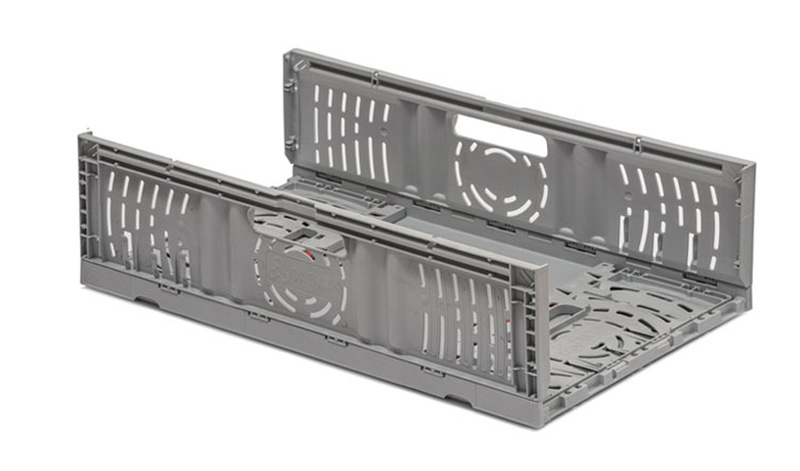 The Twistlock Box is suitable for temperatures ranging from 0° C to 50° C. The technical properties can be guaranteed under these conditions if handled appropriately. The raw materials used in the production of the Twistlock Box comply with the requirements of the FDA and the BGA. The suitability for specific products which are to be packaged has to be confirmed by ISOCO Plastics Technology GmbH. ISOCO is not liable for any damages arising from inappropriate handling of the Twistlock box. We reserve the right to change any of the stated information without prior notice.